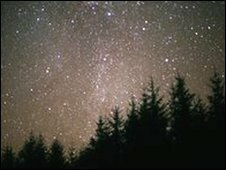 According to the campaign coalition, from 1993 to 2000 - the most up-to-date figures available - light pollution in England increased by a quarter and the amount of light-saturated night sky rose to 7%. It added that altogether councils spend £532m on street lighting each year and the lights can account for around 5 to 10% of a council's carbon emissions. "The costs of not acting are clear: Unnecessarily high energy bills for councils, and therefore for local taxpayers, more carbon emissions, disrupted sleeping patterns for people, disturbance to wildlife, and a night sky bereft of the majesty of the Milky Way."